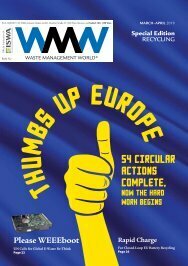 WMW's Collection & Handling chief editor, Malcolm Bates rounds up the latest product news for the waste and recycling industry. Allison Transmission has announced that the latest fuel economy technology has been incorporated into the 1000 and 2000 Series Transmissions. This ‘XFE’ feature is claimed to give fuel economy improvements of up to 7percent (based on figures from 3000 Series models in urban bus operations), but this feature was previously only available on the 3000 Series models. Although the same size as current transmissions, the new XFE package incorporates a redesigned torque convertor damper coupling which produces a first gear range lock-up, while also enabling lower engine speeds in higher ranges. Two years since forging a partnership with Babcock International, Terex Trucks report a strengthening position in the South African ADT market. Babcock is a longstanding equipment supplier in Africa, with a proven record in customer service and support of leading brands. It operates out of a new purpose-built facility in Middelburg, SA. Terex articulated dumptrucks are manufactured in Motherwell, Scotland. Leading Hungarian operator Revesz Group is putting 400 new DAF ‘CF’ and ‘XF’ trucks into service over the next twelve months, after trials confirmed DAF was found to offer the best value for money with the lowest operating costs. In some cases, this amounted to fuel consumption figures up to 7percent better than rival chassis brands. Working mainly with chemical tank trailers, some 180 new DAFs have already been delivered by the end of 2017, the remaining units will be delivered during 2018. Allison Transmission celebrated the production of the 500,000th ‘4000-Series’ fully automatic gearbox at the end of 2017. Production began in the USA in 1993 and to meet demand outside of the North American market, an additional production facility was established in Szentgotthard, Hungary in 2005. Launched at the end of 1977, JCB celebrated the 40th Anniversary of the innovative ‘Loadall’ telehandler late last year. Since the launch, JCB has produced more than 220,000 Loadall telescopic handlers. Although initially aimed at the construction sector, the Loadall range has for many years been an essential materials handling machine in both agriculture and the waste and recycling sectors. Production is now at an all-time high level - figures were up by 25percent in 2017 on those for 2016. There are now 34 base models with over 1000 different configurations. Alongside three new Materials Handlers (see this month’s Cover Story), Caterpillar has also introduced two new five-tine ‘Orange Peel’ Grapples - the ‘GSV520’ and the ‘GSV520-GC’, both of which are available in closed, or semi-closed configuration. Both models are suitable for a wide range of materials handling operations and have performance-enhancing features - such as vertical hydraulic cylinders to give a faster opening action - combined with lower operating weights to provide increased reliability with lower operational costs. Volvo Trucks is now manufacturing Euro-6-compliant trucks capable of running on Liquified Natural Gas (LNG), or biogas that, it is claimed, have the same levels of performance as standard diesel-fuelled vehicles. Significantly, the CO2 emission levels they create are from between 20 and 100 percent lower compared with diesel trucks, depending on the choice of fuel. As Volvo engineers have adapted compression ignition engines to run on gas, the new ‘FH LNG’ and ‘FM LNG’ trucks are claimed to have the same levels of drivability, fuel efficiency and reliability as existing diesel trucks. “This is a combination that our customers in both short, regional and longhaul operations require,” explains Lars Martensson, director of environment and innovation at Volvo Trucks. He confirms the 460hp Volvo gas engine produces 2300Nm of torque, while the 420hp version produces a very credible 2300Nm. Volvo has worked to provide a suitable operating range for the new gas chassis by providing fuel tank capacity for up to 1000 kilometers between refuelling stops. Volvo claims refuelling time should be comparable with existing diesel trucks. To ignite the gas, rather than require a spark (as previously used in gas-fuelled engines), a small amount of diesel fuel is also injected into the engine at the same time to effect ignition. The London Borough of Lewisham has taken delivery of a second Mercedes Benz ‘Econic’ refuse collection vehicle (RCV) with low-entry cab and Geesink Norba ‘Plug-in’ electric hybrid compaction body and hopper equipment. This latest RCV has a specific duty - it is used to collect and remove waste material from Lewisham Market. The street market is at the heart of the community and operates six days a week, so it is vital that material is collected efficiently and with as little impact on the environment as possible. The new Econic is an 18tonne 4x2 ‘1830’ model, powered by a 299hp diesel engine. The Market is open all day in the busy High Street. A demountable on-site compactor was previously used, but this created issues when it was full as the containers needed collection in a busy inner city area. Equally, conventional diesel PTO-driven RCVs were ruled out due to operating noise. The new two-axle Econic was specified as it was compact enough to leave and return to the site for unloading, without causing disruption. The Geesonk Norba ‘Plug-in’ body/hopper can load and compact material without the truck engine running. A three-axle Mercedes ‘Econic’ fitted with Geesink Norba ‘Plug-In’ body is also in service in nearby Deptford Market. The first fully automatic collection vehicles in the German town of Aurich were purchased on 2011. Now an additional new Faun ‘Sidepress’ unit has recently been delivered - a DAF CF 75 specified with an Allison ‘3000 Series’ fully automatic gearbox and sideloading body. Since 2011, the fleet operated by MKW (Materialkreislauf und Kompostwirtshaft) GmbH, has grown to nineteen DAF CF rearsteer 26tonne sideloaders, servicing around 100,000 households in the East Frisian mainland. It is a rural region, where the vehicles are driver-only operated. “Our decision to go for fully automatic transmissions has paid off,” explains Carsten Applehoff, technical fleet manager at MKW. “It has enabled us to speed up our operations. In a nine-hour shift, we are now able to empty around 1200 refuse bins - in some cases even up to 1500,” he adds. In terms of operating costs, the automatic DAFs have also delivered. “The only required maintenance for the transmissions has been routine oil and filter changes,” Carsten confirms. But here’s a surprise;- “The fuel consumption figures of our trucks fitted with fully-automatic Allison transmissions is about ten percent power than those fitted with automated manual transmissions (AMT),” he confirms. A new portable bin-weighing unit has been launched by All Weigh Scales Limited of Daventry, Northants, UK. Called the ‘WBW Weighter’, the new unit is a ‘lift and weigh’ trolley incorporating a load cell with digital LCD display. Using a simple foot pump, the operative lifts the waste bin, or container off the ground. The battery-powered indicator comes with a mains USB charger. The display can be used to monitor recycling rates of as a basis for charging for collection of foodwaste etc. The unit can weigh bins up to 550kg. Based in Surrey, UK, Britanniacrest Recycling has added a new Volvo ‘L150H’ articulated loading shovel to a a busy waste and recycling fleet that includes over forty Volvo trucks. “The Volvo L150 articulated loading shovel is the optimum size for working in our three busy recycling operations in Warnham, Storrington and Gatwick,” explains co-director Ray Foss. Britanniacrest Recycling now operates two F-models, a G model and two H-variants of the L150 - with another about to be delivered this month. “Overall, the productivity - especially on the F-series and latest H model - has been particularly good,” Ray Foss, explains. 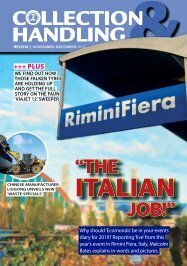 “We specify the machines with the long loader arm option to enable them to load and tamp material down to optimise the payload of our high sided articulated bulk trailers,” he adds.